TORONTO (AP) — Craig Kimbrel felt bad about making his Boston Red Sox teammates play an additional inning. Mitch Moreland didn’t seem to mind. 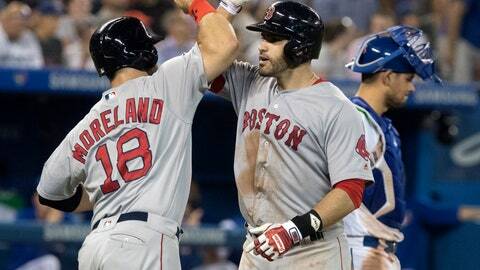 Moreland hit a three-run homer during a five-run 10th inning, helping the Red Sox overcome Kimbrel’s blown save to beat the Toronto Blue Jays 10-7 on Tuesday night for their fifth straight win. Boston is the first big league team to reach 80 victories this season. Moreland’s one-out shot off Ken Giles (0-3) followed a triple by Mookie Betts and a walk by Andrew Benintendi. The All-Star first baseman drove in four. Jackie Bradley Jr. added a two-run homer later in the inning. Giles was charged with five runs in his first home appearance with Toronto since being acquired from Houston in a deal that sent back Blue Jays closer Roberto Osuna. Kimbrel (3-1) gave up a solo homer to Justin Smoak with one out in the ninth, tying the game at 5. Kimbrel stuck out the side otherwise. It was Kimbrel’s second blown save in four outings. J.D. Martinez hit a three-run homer in the eighth, his major league-leading 34th. Martinez finished 3 for 5 with four RBIs. Red Sox manager Alex Cora said power is a “huge” weapon for his team. “We always feel we’re one swing away from getting back into games,” he said. Boston used a four-run eighth to turn a 3-1 deficit into a 5-3 lead but couldn’t close it out. Toronto’s Luke Maile hit an RBI double off Matt Barnes in the eighth before Smoak tied it with his shot off Kimbrel, connecting on a 3-0 pitch. Boston got just two hits over seven innings against starter Marcus Stroman. Stroman came out to warm up for the eighth but didn’t throw a pitch, leaving with trainer Nikki Huffman after she visited the mound to examine a blister on the middle finger of his pitching hand. Ryan Tepera came on and loaded the bases for Moreland, who hit an RBI fielder’s choice. Martinez followed with a drive off the left field foul pole. Tepera was ejected for arguing with home plate umpire Ed Hickox as he walked off at the end of the inning. Devon Travis and Kevin Pillar each hit a two-run home run for the Blue Jays. Toronto has lost 11 of 14 games against the AL East-leading Red Sox, owners of the best record in baseball. Red Sox left-hander Drew Pomeranz allowed two runs and four hits in 4 2/3 innings, matching a season worst with five walks. The retractable roof at Rogers Centre was open when the game began but started to swing closed in the middle of the fifth. In the eighth, a steady stream of water could be seen leaking into the seats in right field as heavy rain fell outside. The parking garage beneath the stadium was flooded. Six of Moreland’s 14 home runs this season have given the Red Sox the lead. Red Sox: LHP Chris Sale (mild left shoulder inflammation) is scheduled to come off the 10-day disabled list and start against Baltimore on Sunday. Sale (11-4) last pitched July 27. … 3B Rafael Devers (strained left hamstring) is expected to be activated off the disabled list Wednesday, the first day he is eligible. Blue Jays: Toronto put INF Brandon Drury (broken left hand) on the 10-day DL and recalled INF Richard Urena from Triple-A Buffalo. Red Sox LHP Brian Johnson (2-3, 3.74) faces Blue Jays RHP Mike Hauschild (1-0, 0.00) on Wednesday. Johnson is 2-0 with a 3.94 ERA in three career starts north of the border. Hauschild picked up his first career win by tossing six shutout innings of relief against Seattle last Thursday, his Blue Jays debut.